St. Charles, Illinois - Guyette & Schmidt, Inc. conducted their annual spring decoy auction on April 26 & 27 at the Pheasant Run Resort in St. Charles, Illinois. 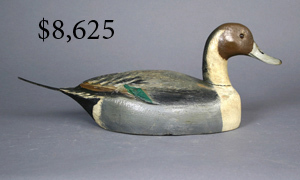 The auction was held in conjunction with the National Antique Decoy & Sporting Collectibles Show and grossed $5,021,131. The sale pushed Guyette & Schmidt, Inc. total sales to over $100,000,000. 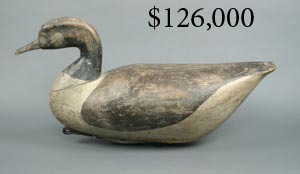 The crowd was large and the prices were high with 11 decoys selling for over $100,000 and 88 lots sold for over $10,000. The $7,821 average price per selling lot was the highest ever for Guyette & Schmidt, Inc. In all statistical categories the auction was only second to the January 2000 sale of the Dr. James McCleery collection, which was a joint effort between Guyette & Schmidt, Inc. and Sotheby's. 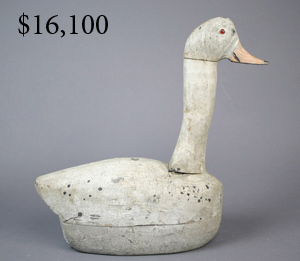 One of the most interesting aspects of this auction was that it contained many quality decoys that had sold at auction previously and therefore presented a great look at how the decoy auction market is evolving. Once again a great decoy, a curlew by William Bowman, which sold at the Jim McCleery auction in 2000 for $87,750 brought a huge return selling this time around for $313,000. Other examples were a Crowell dust jacket style black bellied plover, purchased for $55,000 in 1986, brought $291,000. 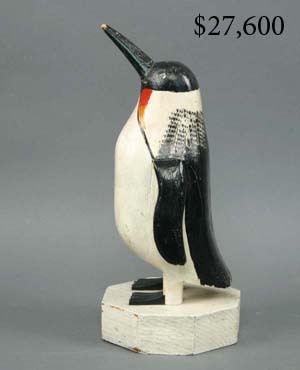 A Crowell dust jacket style upright plover, purchased in 1991 for $22,000, brought $137,000. A Crowell feeding semi palmated plover purchased for $22,000 in 1991 brought $214,000. Other highlights from the sale include a dowitcher by William Bowman that sold for $137,000. 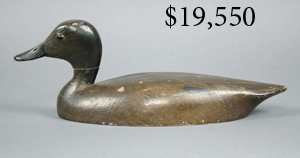 A John Williams ruddy duck established a world record for the carver when it sold for $159,000. It sold for $39,600 in 1990. A Walter Brady Canada goose that sold for $55,000 in 1990 sold at this auction for $126,000 and a Nathan Cobb curlew that sold for $31,000 in 1991 brought $258,000 at this sale. An Ira Hudson yellowlegs sold over estimate at $80,500 and had sold in 1990 for $23,650.